Water moves, stands still, creates and destroys. Enfield Creek has cut through hundreds of feet of bedrock over the last hundreds of years to create the "new" gorge in the upper region of the Robert H. Treman State Park near Ithaca, New York. This is the glen the Enfield Creek in the Robert H. Treman State Park has created by eroding through hundreds of feet of bedrock. It has created a home for ferns, mosses, shrubs, wildflowers and trees which cling to the edges of the gorge. The creek is relentless as the force of gravity pushes the water ever downward, slowly trimming back millimeters of rock each year. Is water destroying, creating or just the architect of change? Many smaller and a couple of larger waterfalls are Nature's tools of change in the three mile long gorge through the Robert H. Treman State Park near Ithaca, New York. 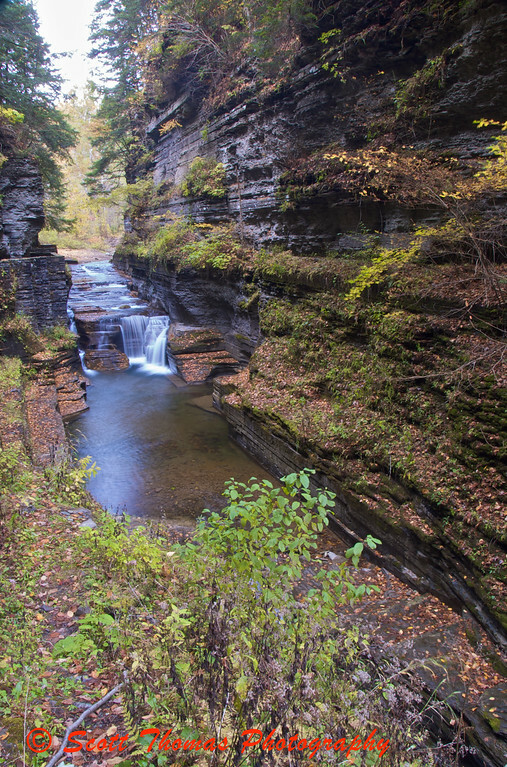 This entry was posted in Assignments, Nature and tagged gorge, ithaca, new york, Photography, robert h treman, state park, water, waterfall. Bookmark the permalink. Rascal. These are beautiful, though. It’s interesting that a photo of rock walls is truly an image of water and its power. More to think about here than how pretty the park is . . . This is the “new” gorge and was formed “recently” by the creek. The larger area about 100 feet beyond this area is the “old” gorge and was formed as the glaciers receded. New and old being very relative in terms of Earth history. Think in centuries. Beautiful images Scott, water is an incredible cutting tool isn’t it !! I kept looking up at the gorge walls which rise over 100 feet in this area and kept trying to think how long it took this little creek to work it’s way down to this point. It boggles the mind! Thank you, Anna. I really need to get an ND filter. The shaded gorge and a polarizer allowed an 8 second exposure to capture the flow in silky threads. These are beautiful, Scott. I like the close up on the waterfall very much. I have been places like this too seldom. And then without tripod. The lines in the eroded rock in the first image draws attention to the falls. Well composed! I am trying to become more aware of things like leading lines and framing as I am in the field. A straight on shot had too much clutter and just a slight move to my left brought this scene and I knew I found a good one. Try and find even a small tripod. I like to have a Gorilla one with me just in case. It’s so tragic to see water destroy, but I like to think of it as the architect of change. Your images are absolutely beautiful, if only I knew the angle and composition the last time I visited the waterfalls. I like to think of water as changing and not destroying. When left alone to work, water creates beautiful and bountiful places. Both shots are gorgeous! Water, in all of its forms, is always creating. I love this second picture; man, that bad boy doesn’t even look real! Great stuff. Hey, we should all take a ride down next summer. Easy access along well maintained and relatively flat trails. Make a good day trip. I bet you could make a kitchen faucet look good, KD. Hey, there’s some good waterfalls near you so get on out there. Your photos are astoundingly beautiful. I have tried to choose a favorite, but can not. Both have unique characteristics that make them stellar. I love the place where Enfield Creek flows through the gorge. The blues of water and rock wall along with the misty waterfall makes this a work of art. 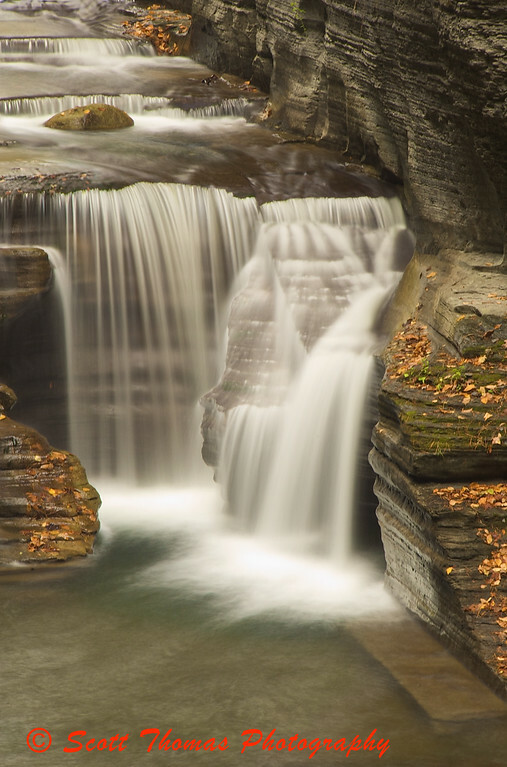 The second, from Robert H. Treman State Park, thrills me with your perfect capture of falling water and golden leaf studded rocky terrain. You excel at landscapes, including those with moving water. Thank you so much, Karen. As much as I enjoy your ocean and Florida marsh photos, I am glad you like my inland waters. The diversity all around is such a joy to photograph and share. It is very inspiring to see how you work (or play 🙂 with your camera and make it performe on a high level. These photos look so magic to me, that I´m expecting an elf to be hiding behind the rocks somewhere. Beautiful. The second one is particularly striking. Wow, what fabulous shots. Both are great but I’m really digging the second one. Nice.